new habits, one at a time. Success starts with planning. What is the goal? (good health). What is the action (daily dose of fish oil). Do I have what I need to get started? Yes. When? After dinner. So why wait to begin? The WLC will be easier if I am already engaged in the various daily actions. I decided to resume taking fish oil last night. 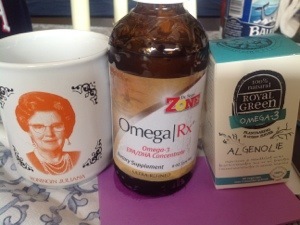 I have a couple bottles of “The Zone” brand Omega RX EPA/DHA liquid concentrate. (The liquid is less expensive than the capsules, but capsules travel better.) I store the bottle in this nice coffee mug. It’s probably a violation of Royal Protocol. The recommended dose is 1 tsp. I have a little shot glass for measuring. A couple years ago, I took a higher dose regularly. At the time, I was having a lot of joint pain and was training heavily for a half ironman triathlon. Things are different now. The joint pain is gone and my training load is much lower. My c-reactive protein level is very low (I got a blood test after feeling freaked out by the books I was reading – my cortisol level was fine too). So I will stick with the 1 tsp. dose. When I was taking more, I got a spontaneous nosebleed and asked Dr Google, who said, yes, high doses of fish oil act as blood thinners and can cause nosebleeds. Powerful stuff. While at the store today (stocking up on maxifuel gels for the Limburg ride Saturday), I yielded to the impulse to buy some “Royal Green” brand algae oil. Also labeled as Huile d’algue and Algenolie (French and Dutch, of course). These capsules have 200 mg of DHA. The Zone liquid has 900 mg per tsp/5 ml. I’ll need to go back and read the WLC directions to see what they recommend. Then I’ll think for myself. You should too. I have also decided to keep in mind the bigger picture. I came across a lovely young woman who is writing about her cancer treatment, which began a week ago. Her suffering breaks my heart wide open. I can choose my food intentionally, move my healthy body happily, and keep moving forward. It might be a challenge (thus the name), but I’m up to it. Posted in mindfulness and tagged habits, whole life challenge. Bookmark the permalink.